This program updates the camera firmware to version 2.0 and enables the camera to work with SanDisk® Memory Stick PRO Duo™ media cards. The process for upgrading the firmware is to download the compressed firmware file to your computer and then copy it over to Sony Memory Stick Duo™ media. The media is then inserted into your camera and a series of steps are taken on the camera to complete the installation. IMPORTANT: This firmware update is only for a DSC-H2 Cyber-shot camera that has Version 1.0 of the firmware installed. Only DSC-H2 cameras that meet the criteria for the current firmware version should proceed with this firmware update. Follow these steps to check your firmware version. Set the mode dial to (Auto adjustment mode) before turning on the power. Press the Playback button and the Menu button simultaneously. NOTE: When the Cyber-shot screen disappears, release them. Move the control button rightward to Setup, and then move it further towards the right. 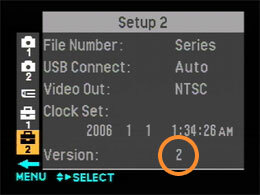 In the Setup screen, move the control button downward to select Setup 2. Check the firmware version that is listed. If Version 1 is listed: Please proceed with the setup below to download and perform the firmware update. If Version 2 is listed: This firmware update is not necessary. Do not use this firmware to update any other models of Cyber-shot cameras. This Digital Still Camera firmware update and any changes incurred by it are permanent. It is not possible to return to a previous firmware version after updating this firmware. By continuing this update process, downloading and updating this firmware, acknowledgement of awareness and understanding that this update cannot reverse this installation. Please contact your local Sony office, if you encounter any problem while performing the firmware update or if you do not own a Sony Memory Stick Duo media. By updating the firmware, settings other than Video Out and Language will return to the default settings. The file number of the next image to be recorded will be reset to "DSC0001", regardless of the images previously recorded. If you have already recorded images with the camera, newly recorded images may have the same file numbers as images previously recorded. Take care to avoid file name conflicts and to avoid overwriting previously recorded images when transferring images to your computer. Supplied Batteries or the ACV-LS5K AC Adaptor (purchased separately) - Ensure the batteries are fully charged or the AC adaptor (not supplied) is plugged into a working outlet. Please note that the camera may not operate properly if the power is interrupted during the update. Use only the USB cable supplied with the camera. Please note that the Update functionality is not guaranteed if you use any other USB cable. For the Windows® 2000 and XP Operating System Only: During the installation of this update, be sure that you are logged in as the Administrator or as a user with Administrative rights. 2. After downloading DSCH2V2.zip, please double-click DSCH2V2.zip to extract a file that is to be copied to the Memory Stick media. 3. The extracted file name should be DSCH2V2.ash. 4. DSCH2V2.ash may be extracted at the same time when downloading the DSCH2V2.zip, depending on the Operating System environment. Please click and follow the steps accordingly in Software Updating Instructions to update the firmware in Cyber-shot DSC-H2.